This entry was posted in Life Events, TV Reviews and tagged Bob Dylan, Dhani Harrison, Eric Clapton, George Harrison-Living in the Material World, HBO, HBO GO, John Lennon, Klaus Voorman, Martin Scorsese, No Direction Home, Olivia Harrison, Paul McCartney, Phil Spector, Ringo Starr, The Band, The Last Waltz, The White Album, While My Guitar Gently Weeps. Bookmark the permalink. I didn’t realize what an incredibly spiritual guy George Harrison was, and also learned that he was the consummate English gardener. I watched the Harrison documentary and it was really wonderful. I was 14 years old when I heard my first Beatle song and through the formative years of my life they were the group. Hearing a song from the group, or any one of them moves me profoundly. I sort of hate that. Billions of people love these guys so I am just one of the masses. But they’re so good, they mean so much to me that, hey, who the hell cares. When I picked out songs to play at my memorial (whenever that it) they were almost all Beatle songs. I too am one of the masses. I remember listening to the Beatles, The Stones, and Simon and Garfunkel through your door when I was really young. The Beatles are woven into the fabric of our souls. They are the soundtrack of our lives. I get very emotional too when I hear their songs. I thought it was very emotional when they played Long, Long, Long from The White Album as the credits rolled. I also like how they used George’s great song All Thing Must Pass several times with great effect. May I ask what Beatle songs you picked? Somewhere, buried in a old camphor chest, is a photo of me at age 7 posing next to my phonograph with my very first record, a orange and yellow Capitol swirl label 45 of I Want to Hold Your Hand, with I Saw Her Standing There on the B side. 45 years later, Standing is still my favorite rock and roll song-I’ve listened to it literally hundreds of times and I can’t sit still when it’s playing, it thrills me to my marrow each and every time. Our loss is on several levels too. Our youth, our innocence, our heroes. I know you know what I mean. Well said, John-I’m remembering a column in the Absolute Sound where someone expressed shock and dismay at the price of a high end turntable, the reply was “well, it’s cheap for a time machine!” Sir Paul has been number one on my concert bucket list for many years, I’ve got to make it happen. I’ve been able to see a couple of Ringo’s All Starr Band shows, and the wave of emotion I felt standing 40 or so feet away from him while he was singing With a Little Help From My Friends is something that it almost indescribable, but you did it beautifully! 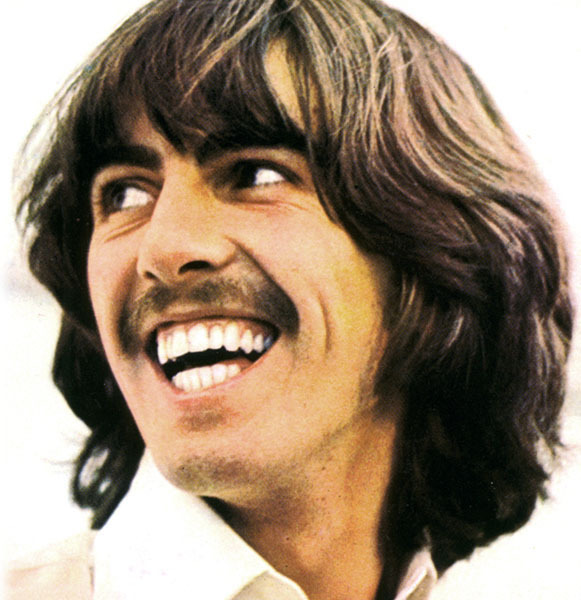 I’ve been listening to a lot of George’s solo stuff in the last few years-it really connects with me emotionally and spiritually. The posthumously released Brainwashed really knocked me out and still does, a rich and rewarding listen that I return to often. I watched the Harrison documentary last night and really enjoyed it. A few quibbles-I thought some of the transitions were a bit abrupt, and I couldn’t help but notice Yoko using the occasion to get in yet another dig at Paul, elevating John in the process, of course. Loved the reminisces of Voorman, Clapton, Jim Keltner (is there a better session drummer? ), Ringo, Derek Taylor’s wife and Olivia, and it was a wonderful touch having Dhani read his father’s letters. Have you read the Bob Spitz Beatles biography? Great stuff, almost half the book concentrates on their childhood and high school years in Liverpool. Another highly recommended read is engineer Geoff Emerick’s Here, There and Everywhere: My Life Recording the Beatles, a fascinating (particularly for us audiophiles) fly on the wall account of how they created those timeless recordings in the studio. Dead on with your comments on Yoko. What’s her problem?? I haven’t read the Bob Spitz bio but I will now based on your recommendation. I haven’t read the Geoff Emerick book either. I guess I have some homework to do. Be sure to check out the comments of my Brother Tim and listen to his links he embedded for “Sound Check” that delve into this great band we all know as “The Beatles”! I didn’t get to see the George Harrison documentary. Don’t know what happened, but I missed it. Maybe I can catch it again sometime in the future. I did hear a couple of SoundCheck episodes where they talked about the doc and I thought I would post links to them hear if anyone would like to listen to them. It is interesting to note on Soundcheck that there is the feeling that all of the Beatles played an important role and though some may have taken a bigger portion of the share in some ways they all were great contributors to making the Beatles one of the best bands in Rock-n-Roll history. Checkout these episodes and see if it doesn’t add a little more to your resolve of just how great a band they were. Forgive me, but I find George Harrison an incredibly overrated musician. Yes, he has some glorious tunes in his catalog, but he also has a spectacular number of duds. Perhaps it was for these reasons that I fell asleep during this doc. It takes a lot for a musician bio/doc to interest me. The last ones I can remember loving were the Harry Nillson bio (available on Netflix as of 2/2012) and Lou Reed’s “Rock & Roll Heart” doc, which was part of the PBS American Masters series. GG Allin: you can’t be wrong about how you feel, but as you might guess I couldn’t disagree with you more! George may have had a few “duds” but he was still a great musician. Certainly some of the greatest guitar players of rock-n-roll admired his playing (Cheif amoung these would be his close friend Eric Clapton. Check out his comments about George in his autobiography). I haven’t seen the American Masters program on Harry Nillson or Lou Reed, but I bet they were worth watching. Thanks for the comments and keep ’em coming. It’s actually nice to get a comment from someone who disagrees with my opinion. The Nillson doc wasn’t part of the AM series, but Lou’s was. Both are well worth watching even for the casual fan. I just discovered your blog – thanks for responding!